The tab view is a fairly common construct in modern user interfaces. The BTabView class serves as a container for a series of BTab objects as well as their target views; the tabs run horizontally across the top of the view from left to right, and beneath them is a container view in which the currently-selected tab's target view is presented. A box is drawn around the container view to clearly define the relationship between the tabs and the container view. 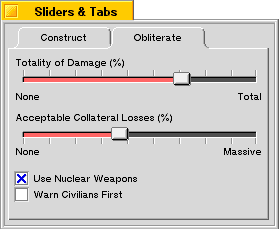 In the figure below, we see a window that contains a BTabView with two BTab objects attached, called "Construct" and "Obliterate." The "Construct" tab is currently selected, and its target view is visible. 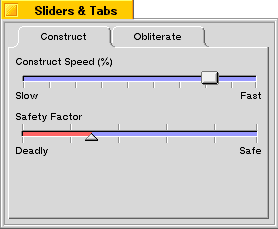 The target view for the "Construct" tab contains two BSlider objects (these sliders are used as an example in the BSlider section and you can learn more about them there). This code creates a BTabView, then sets its view color to the shade of grey used by standard BTabView and BTab objects. Notice that the frame rectangle for the tabs' target views is being computed by taking the bounds rectangle of the BTabView, insetting it by five pixels on each side (to leave some room between it and the bounding box of the BTabView), and subtracting the tab height from the bottom edge of the rectangle. This places the target view inside the tab view. You can adjust this computation to position the target view to your liking. Then two BTab objects are created and added to the BTabView. The ConstView and DestView classes are derived fro BView and represent the "Construct" and "Obliterate" panels of the window (including the various controls contained in those panels).